Let's do the Time Warp (again): It's 1943. Two worldwide wars within two decades have left the world crumbling. While people are still busy killing each other, other people are busy developing plans for lasting peace - and they, kind of, worked; we've seen a period of almost 75 years without war in Western, Central and Eastern Europe. Following the Second World War, we received a formalization of Human Rights (you're not sure about them? Read them! They are very, very relevant today! ), we received the United Nations and we received a proposal for an international currency, the Bancor. Being backed by gold, according to the proposal, the Bancor would be an intermediary unit which would make it easy to relate any currency's value to any other at any given time. Using this inter-currency scheme, countries being in extreme situations of general trading deficits or surplus would have measures imposed on them to stabilize the global economic situation. Back in the 1940's, this idea didn't grow beyond the state of a proposal. 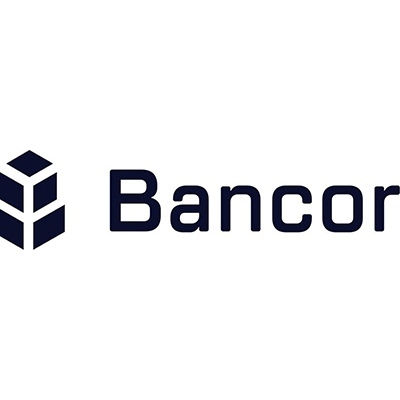 In June 2017, Bancor was born in Cryptoland, by activation of the Bancor Network. We're used to gaining access to new tokens, new coins, on more traditional exchanges, centralized or decentralized, all having a set of trading pairs and an orderbook. That's it in a nutshell - they do have a reason for their existence, though, I've got a couple of very low buy orders for projects I believe in floating around myself, just enough to catch a decent bite if a team member decides to pay his bills by selling off a chunk of his share in the project. It's common, though, to compare exchanges against each other to figure out which route may be the best to use when trying to trade between two less common tokens: Let's say I've got a basket of Golem Network Token from renting out my computer and would like to treat myself to an evening of music played live to fit my mood (it's not the niche SpankChain set out to conquer but it's got all the tech necessary for me to ask a guitar player if he would play some songs for me). A quick glance at CoinGecko shows that I'm going to have a tough time doing this trade - at the time of writing, I would have to route my tokens through several exchanges to get what I need. That's not what I've been looking for, though, I'm trying to find a quick-and-easy route to put my earnings to use. To keep things simple (KISS), Bancor provides interconnected liquidity pools which I can tap into while automatically receiving a good quote on my GNT offered (in this case, using the Bancor Network Token (BNT) as an intermediate token to price and perform conversions); as we've got many different crypto-projects to choose from, Bancor Network considered working across chains as well (applies to Ethereum and EOS at the time of writing). There's a bright future ahead for simple-minded people like me! Looking at Bancor's front page reminds me of Coingecko or other exchanges. A little more complex than my wished-for simplicity but let's dig deeper. Creating an account is pretty much straight-forward, upon creation of a wallet I receive a set of 12 seed words which can be used to connect MetaMask to the funds I hold. Remember to put them in a safe place as Bancor won't be able to restore access to your wallet when lost! Keeping your security in mind, Bancor accounts are secured by a second factor: You will be able to receive the second factor via text message, facebook messenger or a Telegram chat bot. Starting there, it's time to load up the wallet with funds - either by sending ETH/EOS or any of the 140+ tokens listed on Bancor or using their payment processor to buy ETH straight from credit card (fees apply). Once the wallet is loaded, you can swap away; always being offered a current rate rathern than having to fiddle with order-books and do price slippage calculations over various sell/buy orders. 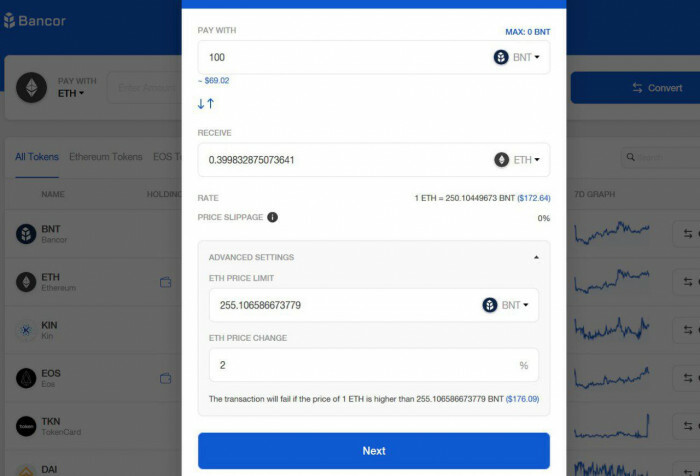 As the counterparty to a transaction on Bancor is a smart contract, it's an easy thing to integrate a price slippage indicator: Whenever your order does too much of a change to the token's price for you to be comfortable with, split the order into several transactions spread over some time to give arbitrage traders the opportunity to straighten out the price. For the more advanced users, it's possible to limit the order to a maximum pricing or a maximum price slippage. Bancor's smart contracts running in the back are oiled by the Bancor Network Token (BNT) which can easily be swapped to ETH and back: Send ETH to the smart contract, BNT are generated according to ETH value; send BNT back to the contract and receive ETH while the smart contract destroys the BNT received. Bancor allows for the creation of further liquid tokens, coupling these to a set of other tokens and pricing them according to the value of each individual token. Thus, a net of interconnected token contracts is created, allowing for seamless swapping of tokens against each other without users ever having to actually hold BNT. As Cryptocurrencies these days are prone to rapid changes in price, the Bancor interface allows for setting a minimum return which aborts the transaction if it does not return the minimum amount of tokens expected. Imagine this: I've got 100 GNT and wish to sell them, receiving 100 BNT in return. While I'm setting up my order, someone else might be selling 10,000 GNT, thus making the price drop - when the amount of BNT returned by the smart contracts does not meet my Minimum Return, the transaction will not be executed. Disclaimer: I'm European, I'm white, I'm in my 30s. I'm not rich in european standards but when looking at the rest of the world, I'm quite well off. The Euros I've got in my pocket can be used anywhere I go on a regular basis, Berlin-Paris-Madrid? (actually I'm more of a rural type of person. I can use these Euros in Unterammergau as well, though). No need to change currencies. For the time being, there's no pressure for me to adopt this Cryptomagic-internet money. Travel 10,000km south, to Kenya where local communities are not served well by the major financial systems, people are thinking of ways to close the cash gap using cryptocurrencies. (this story makes a fine read for itself). Assisted by Bancor's recently launched community currency network in Kenya, local communities introduced their own currency, tailored to suit the needs of the local community - referencing the link above, let's call it Gatina. Gatina-peso bills were printed, put into circulation and the local community doesn't need to care about the US-Dollar or Euro anymore; the Gatina-peso does the trick: a local school noted that there's significantly less pupils dropping out of school since there's a local currency. The problem is: just five kilometres down the road, 2.5 miles, the Gatina-peso is replaced by the Kangemi-shilling: You've picked the wrong neighborhood to spend your money. Some merchants know that they'll eventually need the Gatina-peso and accept it in the Kangemi neighborhood, that's where Bancor Network steps in: By tokenizing the local currencies and having a common "network" token, a merchant coming from Gatina to Kangemi can easily send Gatina-pesos to the Kangemi merchant and, eventually, the merchant can use his tokens to put an out-of-town order putting his peso and shillings against a major international currency. With little access to national currencies, these communities seem to be very open to financial experiments using magic internet money - do take your time to read the referenced article on closing the cash gap as it makes for a very fine read (do me a favor, please, and use the tipping slider right beneath these lines before wandering off to read that one, please :)).